There were four types of lettuce in the punnet -?La Roma Green, endive, radicchio and La Roma Red. The photos below are in that order (thanks to Luc Dedeene from http://www.plantaardig.com for helping me figure that out!). Lettuce ‘Tuscan Salad Mix’. A mix of La Roma Red, La Roma Green, Radicchio and spidery endive for a perfect salad blend which may be picked leaf by leaf. Suitable for containers. 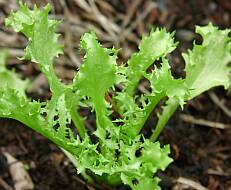 Lettuce prefer a well drained, friable soil and should be protected from snails. Position: Sunny to lightly shaded. Planting Time: All year round. Uses: Salads (radicchio can also be?barbequed). 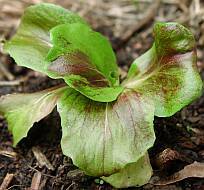 6 Dec 2001: Maryanne bought this punnet of mixed lettuce seedlings, but then didn’t have anywhere suitable to plant them out. After sitting on her garden bench for a few weeks, I planted them in our garden for her.